A cute kitten goes for a ride on his Roomba. He looks like he thinks it’s his royal throne! 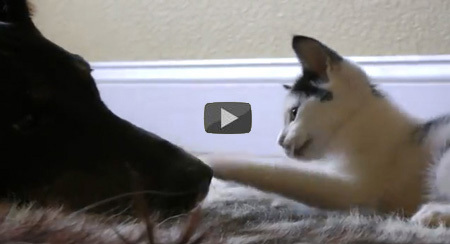 Cute video of a kitten and a Doberman play fighting. Eventually the kitten wins after he wears down his opponent. Even a Doberman can’t defeat that kitten energy. Tara posted this video on Cat Faeries’ Facebook page. It’s got a great surprise ending which we won’t spoil but it involves kittens so it is very cute!